There are three more days of school. Actually, two and a few hours on Wednesday. End of term means that very little teaching is done but there are a lot of exams (assessments) for several weeks for the kids to take. Then, the teachers spend their class time marking (grading) papers and figuring out Term 1 grades for the first report card. Being an American teacher, I do no marking in class time but do it all in my free periods or take it home and work on it. Grade 7 English teachers in Kwa Zulu Natal Province had a “surprise” exam. Grades 3 and 6 were scheduled to do Provincial exams but one-day prior to the exam date, the Provincial education department added in Grade 7 too. So much for what teachers had planned! When there is a formal country-wide (ANA) exam or a provincial exam, there are strict guidelines on how it must be administered. There must be only 30 learners in the room and it can not be administered (invigilated) by their own class teacher. Fair! There is an exact time limit as well. So, due to space considerations, grade 5 played outside while we spread out grades 6 and 7 into three classrooms. Because I teach English to grade 7, I could only invigilate grade 6. It was a very pleasant hour and a half. There were 30 kids, it was very quiet, and they all were working diligently. Wouldn’t it be wonderful to only have 30 students in a class? I remember when grade 3 at North Star went from 20 to 30 kids and how shocked we were. Now, I would give anything to have 30! Oddly enough, although you can’t administer (proctor/invigilate) your own class, you are the one to mark (grade) the exams for your own class. The grade 7 exam is two hours long. It took me 11 hours to mark the 50 exams! Also, the test was just awful, in my not-so-humble opinion. There were mistakes in the English, there were poorly written questions and instructions, there was a story about a car accident where someone died, and the rubrics for marking the writing portions did not go with the prompts. (I got permission to create my own rubric.) By the end, I wanted to call whoever wrote the thing and have a long “chat” with them. It also seemed that they did not even know a twelve-year-old child let alone make any allowances for the fact that these kids are second language learners. Their instructions need to be clear, familiar, easy-to-follow and well-written, with some important words in bold or caps. Not on this test! As you might imagine, my kids, except for a very small handful, did not do very well. But, because the English pass rate is set at 40 percent, only 13 actually failed. I personally felt that only 10 actually passed, given a 70 percent cut-off. I have spent the last week “revising” (reviewing) with Grade 7 instead of doing the mandated curriculum. I am teaching them to read the instructions, what words in the instructions actually mean, techniques to answer reading comprehension questions (look in story!!!! ), how to write a narrative paragraph, never leave a multiple choice question unanswered because you have a 25% chance of getting it right, never just copy the question and think you have answered it, and follow all the directions. I hope this will help them in their future government exams. This was very frustrating, annoying and sad. Also, it was super hot this last week, uncomfortable for teaching, taking exams, and marking exams. On top of this, the tests for maths (they don’t say ‘math’), were three-and-a-half hours late in arriving on their given test date. Students from grades 5, 6, and 7 just stood around talking and playing because they couldn’t start something else just in case the tests arrived. The maths teacher said only 22 out of 50 passed the maths exam. I am sure I will have more to say on teaching, exams, standards, marking and answer sheets in the future. On another note, I am including pictures of my garden. Every single vegetable plant was a victim of bugs and drought except those three pathetic radishes I included last time. 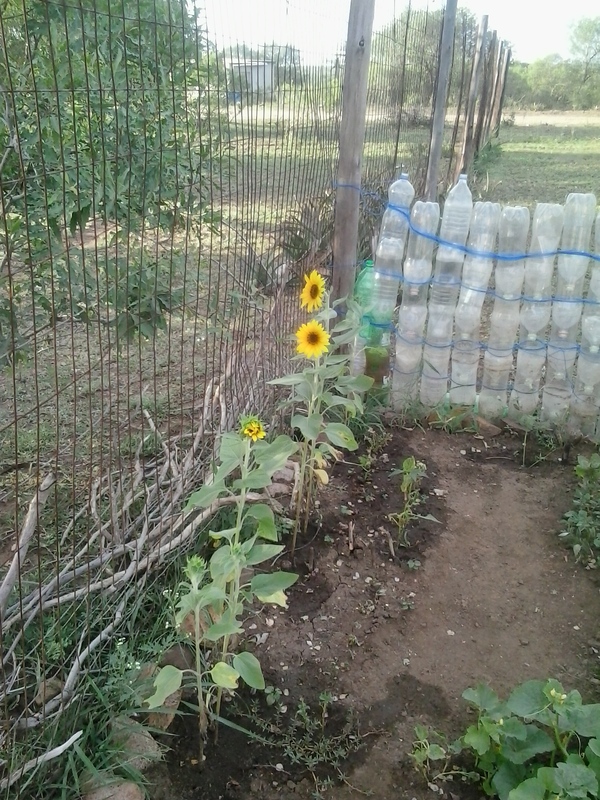 However, the flowers are doing well, along with a volunteer melon vine with no melons. Because it is all inside the four-foot high fenced area, I can’t really see the flowers but I walk over and say “hi” “I am glad to see you” and dowse them with soapy water. It has rained a bit so they even got a good soaking. I bought a small shovel to use. I will try again with vegetables after my holiday, perhaps using yogurt containers and bringing them inside at night. Soon, I will be leaving here for several weeks. I am going to St Lucia on the Indian Ocean with three other volunteers. It is in the Isimangaliso Wetland Park and is a World Heritage Site. From there, we all go to Regional Training near Hluhluwe Park Game Reserve. There I hope to learn how to write the grant to get donations through Peace Corps to electrify Okhayeni Primary School. Last Friday, I went to Newcastle with my principal and two members of the School Governing Board. It was a 4-1/2 hour drive each way! We went to Builders Warehouse to get the invoice for the parts needed on the project. We spent just about all the R20000 donated by Empowerment Concepts. 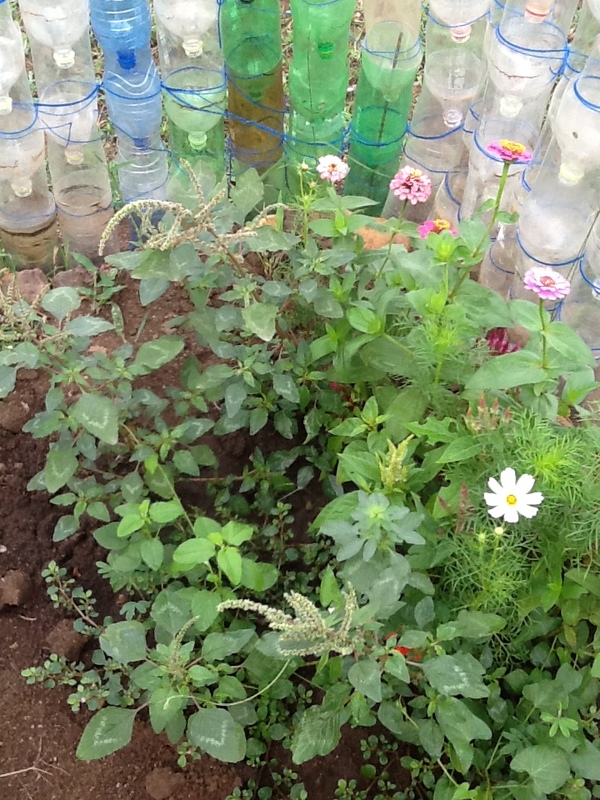 The rest of the project will be funded from your donations through Peace Corps. I will let you know more later. Oh yes, I have done more stenciled paintings on my little house. It makes it even cuter! I have stenciled trees and flowers on the front of my little house. No one here does this! I think it makes it look even cuter. And lastly, but not least, I received a Care Package from America! Lori and Sumaya were the engineers who took great care in putting it together. 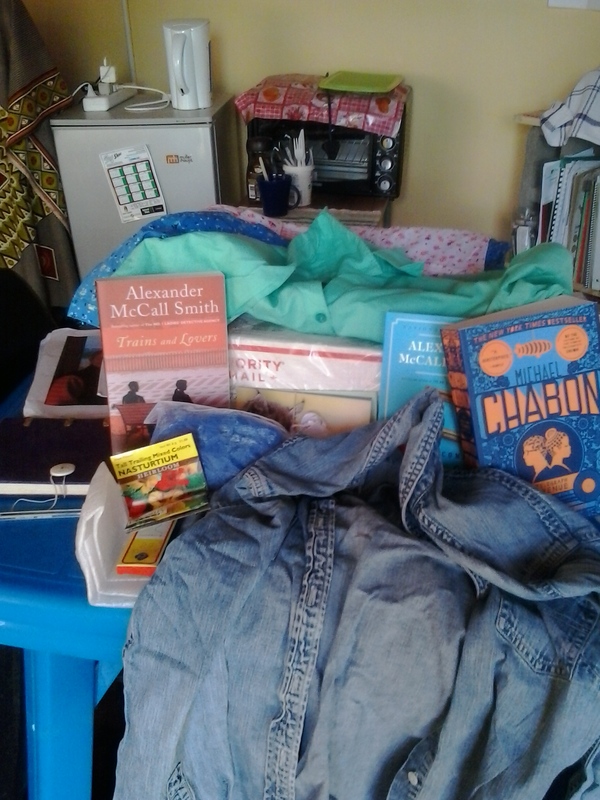 I got the cutest blouses that I get tons of compliments on, my favorite denim shirt, seeds, three good books, lots of cards and letters, Clif bars, and other stuff. It was so exciting to get the package! It took just under a month and didn’t seem to have been tampered with. Thank you! Thank you! 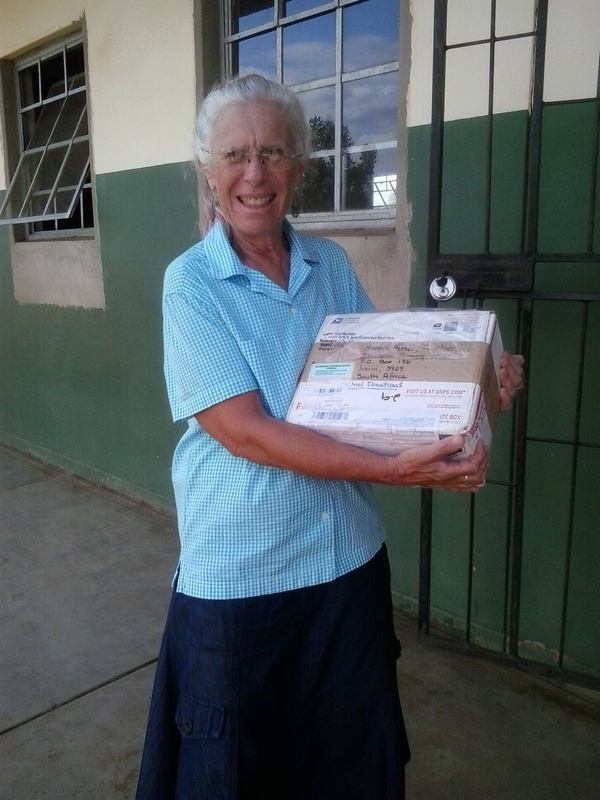 Here I am at school, very happy to have received a care package from my friends. My wonderful Care Package arrived from America. It made me feel loved and cared for. Thank you. Turns out, you take yourself with you wherever you go. For those of you who know me well, the following list will not be surprising. For the newer or less close friends and readers, you might need to rethink who you think I am. I keep thinking: Am I really the right personality to thrive in the Peace Corps, with “thrive” being the operative word? Sure, I can muddle through being sad and lonely a lot of the time and missing the golden opportunity to “connect” with the Zulus. I can be easily discouraged by my attempts to reach out and make friends, rather than “if at first you don’t succeed, try, try again.” I can also work hard at teaching the learners and put less weight on “finding a friend.” I can “embrace” my solitude. Or, all of the above. Or not. Turns out, wanting deeply and insecurely to be included by others is not a great way to start making friends. I always wonder if I have some sign radiating out from my being that only I can’t see. It says “I want you to like me. I want you to like me so much you will invite me to hang out (go for coffee, come to your house for dinner, go to a movie, go to the beach) with you and we will have such a great time together that we will do it often.” It repels rather than attracts. It is too much, too needy. Most people here (everywhere) have on-going lives, with jobs, husbands/wives, children, church activities, extended families, housework. They are not fully available for new friendships even if time, culture, and curiosity allowed it. They are, however, very friendly. I can remember back in 1992 when I moved to Redwood City from Berkeley. I was very lonely, knowing only Pam and Mike. I would drive back to Berkeley many weekends to visit friends. I also was a brand new teacher and often worked 6-7 days/week, 11 hours/day, just to get prepared. And because I had no social life. As time went on, I made a few wonderful friends, got married, and my community grew. I am now at home there (well, not right now, but prior to July 2014). And yet, I left for a while (a LONG while) to join the Peace Corps. Did I think about all my combined personality traits when contemplating this adventure into another country, another culture, another language, far away from my family and friends? Yes, I did. But it is one thing to do it while you are sitting comfortably in your California home, and another thing when you are living it on a daily basis in rural Kwa Zulu Natal. I remember Ian saying, oh, the two years will just zip by. Only in hind-sight my child and wise man. Each day seems very long, not hard, but long. With 20 months to go, September 2016 seems very far away. Six people have left my cohort. We started out as 35 in Philadelphia, ready to fly the big airplane. Now we are 29 in SA30. Whenever I hear about someone leaving (medical or early termination), it hurts, even if I completely understand why they leave and I was not particularly close with them. It is such a personal decision and apparently not unusual for a significant number of PC volunteers to leave at this point in their service. I thought we would all stay together until the end of our commitment. Why am I writing like this, more intimately personal? Partly, because each time I add a new blog post, I get fabulous comments from some of you that talk about a person I don’t recognize as me. Sue H. says my “grit is awe-inspiring.” Toni says I am an “incredible creature.” Eileen admires my patience with the difficulties and “willingness to adapt to some of them.” Carolyn says I am a “trooper.” Others say I am brave and they could never do what I am doing. Get the picture?!? I often think of myself as a big whiny baby (a 69 year old baby?) moaning and groaning about being old and lonely and not being able to sit in a coffee shop, drink coffee, and enjoy free wi-fi. To put things in perspective, last Monday morning I heard about: 9 people of one family who died in a lightning strike, the son of a teacher who was in a car crash and hospitalized, and our Grade 1 teacher being taken in an ambulance to a hospital and kept for 5 days while they tried to figure out what caused her pain, and an Oregon nephew who had emergency abdominal surgery. And I am moping about what?!?! I am not brave. I totally freaked out when a 3 inch toad fell from the ceiling onto my head while I was reading. I totally freaked out at the bat situation. I cried buckets during a unusually severe wind storm. Turns out, you can’t be someone you are not. So, here I am in the Peace Corps. 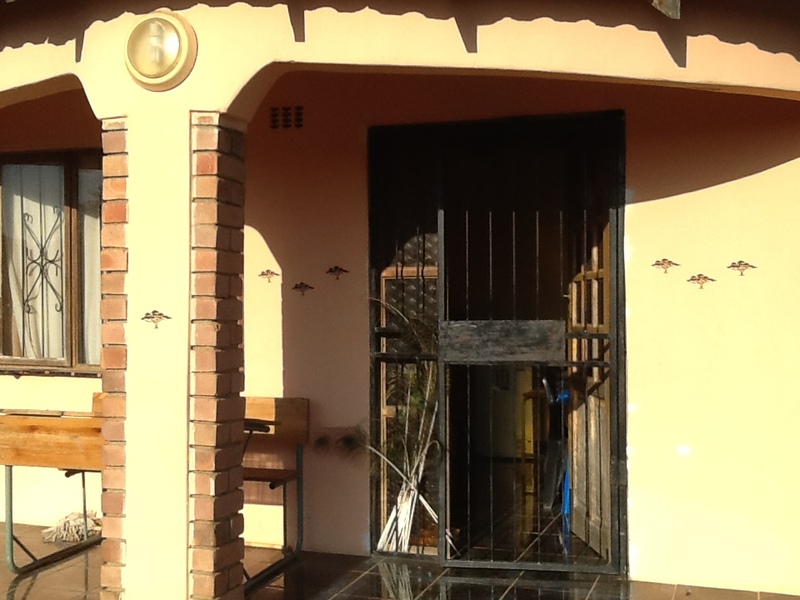 They accepted my application, they decided I should go to South Africa and teach English in a rural primary school plus live in the manner of the local population, and I said “Yes.” I wanted to do this, not even really knowing how hard it would be or how frustrating the bureaucracy rules would be. It IS hard for an old, white, single, highly-educated, Jewish, secular-humanist, female reader to fit in in rural KZN!!!!!! In reality, I am probably doing pretty damn well, given that set of differences. So far, I have no intention of leaving the Peace Corps before my 2+ years is up. I am sick of the bugs flying around and dive-bombing me in the evenings while I am reading, the big spider way up high on the wall, peeing in a bucket, volunteer friends leaving, waiting “forever” in a taxi until it it is full before it can go, and not having a coffee shop anywhere nearby with scones and free wifi. Oh well, if it was easy here, I wouldn’t be here, right? Well, some traits on my personality list are keeping me here. Let’s just hope I am doing some good along with the whining! Update on my cute rondaval: I made it cuter. While I was at the Victoria and Alfred Wharf in Cape Town, I spent a lot of money on stencils, oil paint, and brushes. I have painted little trees on my house (to combat ugliness)! 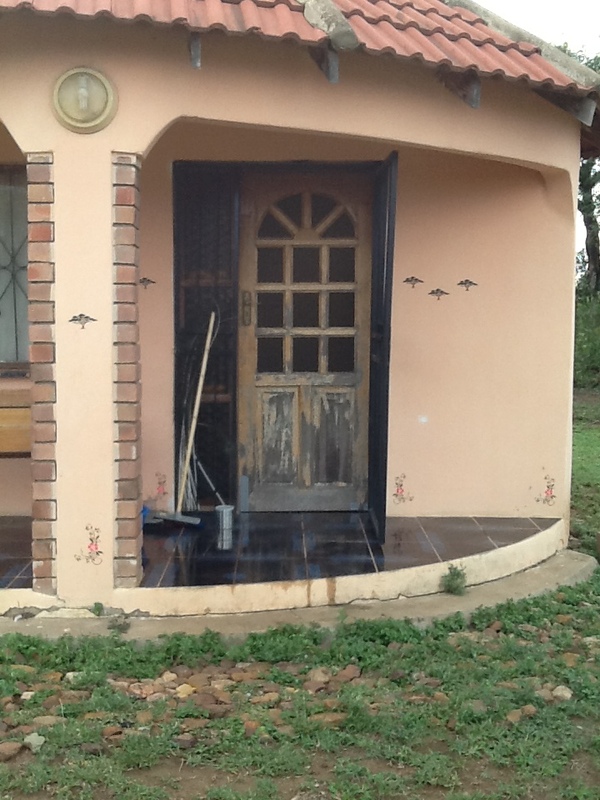 I love seeing my new African trees painted on the front of my rondaval. I can’t decide if I should stop at minimal and understated or add more. 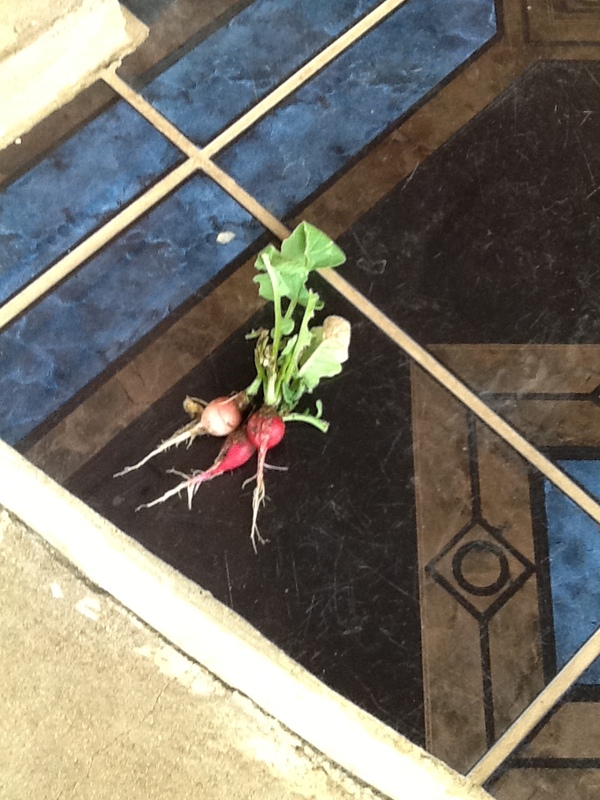 Update on the garden: I have harvested three skinny, not very red radishes. I gave a teeny bite to my host mom and she was surprised at the tang/heat. No one has radishes here. That may be all I have. Some bug (perhaps the 2 inch long grasshopper) is sneaking in and eating my baby bean plants and lettuce sprouts. The sunflowers have tiny buds in the centers! Here are three scrawny radishes. Only one made it into a salad.